With the new data integration, spotted by MacRumors, users now have access to information covering Amtrak's Northeast Regional, Acela Express, Keystone, Lake Shore Limited, Pennsylvanian and Maple Leaf lines. Data is largely limited to certain cities where transit directions are already available in Apple Maps. In addition to Amtrak timetables and routes, Apple Maps' transit functionality went live in Boston with full infrastructure support for bus, subway, trolley and rail services, The Boston Globe reports. 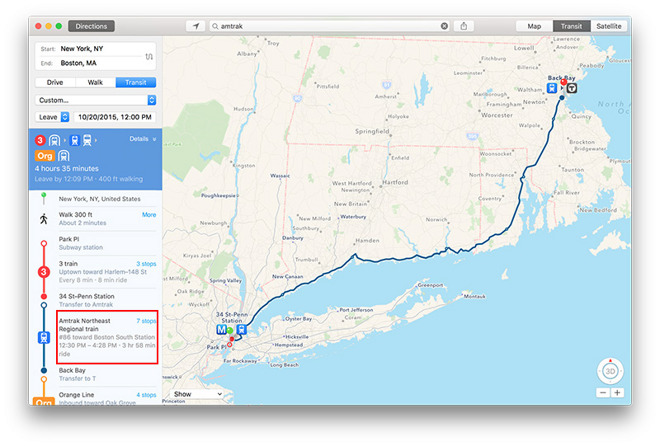 Apple announced plans to bring transit directions to the Boston area earlier this month. Apple Maps transit compatibility is slowly rolling out in major cities around the world. Currently, the service is available in Baltimore, Berlin, Chicago, London, Mexico City, New York City, Philadelphia, San Francisco, Toronto and Washington D.C., as well as 30 cities in China. For Apple Maps, public transit integration has been a long time coming. Competitor Google Maps has for years offered similar features, but Apple's service adds in extra functionality like top-down views of underground subway and train stations for efficient route planning. Apple Maps also incorporates Siri virtual assistant commands and digital reproductions of real life signage, allowing users to more easily recognize upcoming stops.